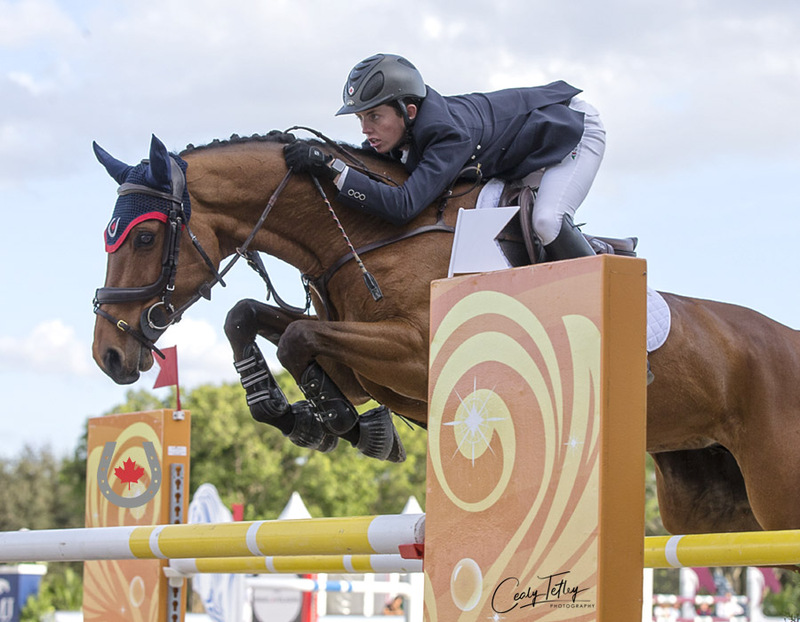 Canada’s up-and-coming jumping athletes made their mark during team competition at the CSIO 5* CP Palm Beach Masters, held Feb. 13-17, 2019 at Deeridge Farms in Wellington, FL. The Palm Beach Masters played host to the CSIO-J Friendly Team Competition and the CSIO-Y Nations Cup, where teams of three or four riders went head-to-head over two rounds, modeled after traditional FEI senior nations cup classes. Led by Chef d’Équipe, Canadian Olympian Beth Underhill of Schomberg, ON, The Eh Team faced three strong teams of next generation international athletes. Despite being at a disadvantage as the only team comprised of three rather than four riders, which meant they did not have the luxury of dropping their lowest score in each round, The Eh Team pulled together to take second place on a two-round total of 12 faults. As the pathfinder, Tindale was the first to contest the 12 obstacles and 15 efforts set at 1.40m, and featuring double and triple combinations and a liverpool. Paired with Djibab van de Linthorst (Nabab de Reve x Amethist), an 11-year-old Dutch Warmblood gelding owned by Tindale Farms, she had the distinction of being the first rider of the class to achieve a clear round. Peixoto Ferreira Filho added another clear round to the team’s tally riding Finola (Cardento x Quick Star), a nine-year-old Dutch Warmblood mare owned by Everse Horses. Bergeron was working on a clear, when a toe on a skinny rail at fence seven added four faults to her score aboard Dallas (Douglas x Nimmerdor), an 11-year-old Dutch Warmblood stallion owned by Susan van Lammers. At the close of round one, The Eh Team was tied for second on four faults with the Stars and Stripes team. Danish Connections was third on 14 faults, while the United Nations Team sat fourth with 17 faults. Bergeron would prove to lead the team during round two - which asked riders to complete the identical course for a second time - after guiding Dallas to a foot-perfect round. Her teammates kept their scores to four faults each – Tindale having a slight rub at an oxer early on course, and Peixoto Ferreira Filho also falling victim to the skinny vertical at jump seven. The Eh Team’s anchor rider, Emma Bergeron, dug deep during her first team competition to put a clear on the board in round two with Dallas and secure the team’s second place finish. This brought The Eh Team’s two-round total to 12 faults to keep their second place position. Stars and Stripes came out on top with four faults, United Nations finished third with 22 faults, and the Danish Connections took fourth on 29 faults. 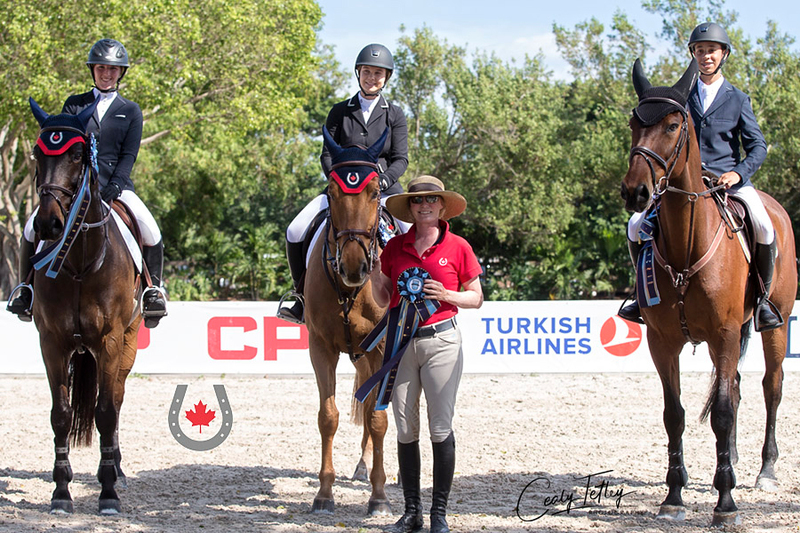 Next up was the $10,000 CSIO-Y Nations Cup, where Canada was well represented by Sabrina Lefebvre, 19, of Mirabel, QC, Alexanne Thibault, 21, of Boucherville QC, and Sam Walker, 16, of Nobleton, ON. 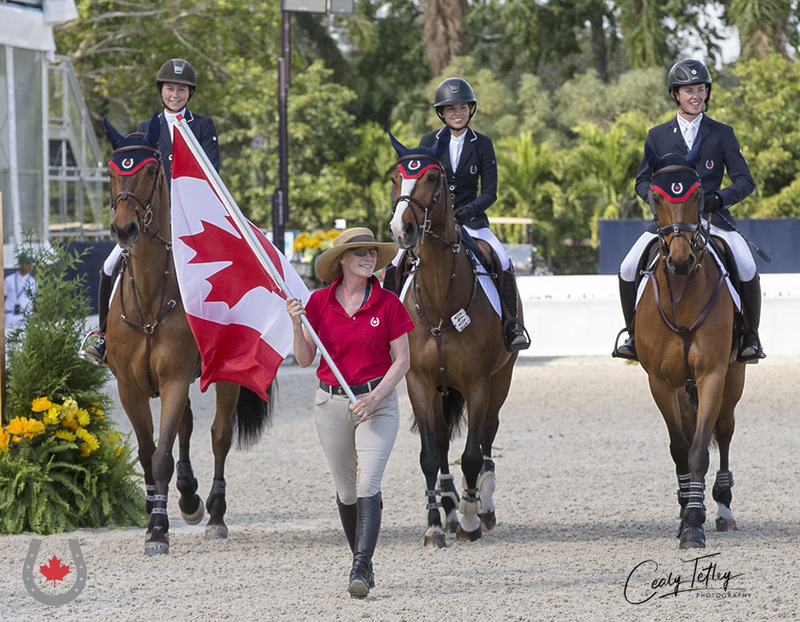 Like their junior counterparts, with just three members, the Canadian Young Rider Team did not have the opportunity to apply a drop score in their rounds. They faced a similar course of 12 jumps and 15 efforts, but with jumps raised to 1.45m in height. Thibault was the first team member on course with Sanjay (Canturo x Acord II), her 11-year-old Slovakian Warmblood gelding. Although they encountered a few challenges to incur 16 faults, they returned to finish on an improved 12 faults in the second round. Lefebvre opened with a clear aboard her 12-year-old Zangersheide mare, Alaska (Asca Z x Concorde), and lowered just one rail in round two for four faults. Anchor rider, Walker, who catapulted into the spotlight after becoming just the fourth Canadian in history to win the ASPCA Maclay National Championship in the fall of 2018, added another clear on the leaderboard for Canada in the first round, paired with Coralissa (Com Air x Corrado I), a nine-year-old Holsteiner mare owned by MarBill Hill Farm. During the second round, the duo were working on a clear when they had a heartbreaker rail at the very last fence on course for four faults. This brought Canada’s team total to 36 for fourth place. USA Team 1 emerged the winners on 12 faults. Mexico was second with 25 faults, while USA Team 2 took third with 33. For more information and full results from the CSIO-J and CSIO-Y team competitions, visit https://palmbeachmasters.com . TThe Canadian Young Rider Team proudly representing the maple leaf during the parade of nations.